An interesting outcome of the implementation of IMS is that the business of telecommunications may evolve to look more like the old PSTN than like the Internet. (This is not necessarily a criticism: to move forward it’s sometimes helpful to learn from the past.) To illustrate this, we shall look at just one of the featured benefits of IMS – QoS. The ability to deliver QoS through session management is an important feature of IMS. By making the transport layer aware of call sessions, then it is possible to deliver guaranteed QoS, at least by one measure. The decision about what to measure becomes very, very important. Today, the discussion of QoS tends to resolve around minimizing jitter and latency in voice and video streams. Jitter can cause sound/picture distortion and loss of information. Too much latency can cause conversation to become difficult and unnatural. However it is possible to define QoS in many other ways. For a user accessing a database, response time may be important and data error rates will certainly be of interest. For a customer watching a movie, latency may be of no importance (because the video stream can be buffered for a few seconds without damaging the overall enjoyment of a two-hour movie) but any residual jitter that affects sound and picture quality will be a concern. In the traditional PSTN environment, QoS focused on call completion success rates, not voice quality and not latency. Latency is naturally low in a circuit-switched environment. Voice quality is uniformly not-too-bad, and difficult to measure objectively anyway. In the circuit-switched world, the number of calls connected is limited by network capacity. Once a trunk is completely loaded with voice calls, no new calls can be accepted and so those new calls fail. PSTN carriers measure that failure rate and use it as a measure of QoS. 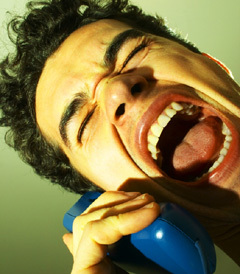 In a situation of rapid customer growth (which the PSTN network has experienced for most of its life), failed calls were a consistent cause of customer complaint. Measuring call failure therefore provided a reasonable proxy measure of customer satisfaction. It also provided data that could be used to pinpoint priorities for growing network capacity. "In the circuit-switched world, the number of calls connected is limited by network capacity. " By comparison, in the unmanaged world of IP telephony it is possible to initiate new call sessions even when the route between the end points is already heavily loaded. The result can be that voice quality and latency on the new call is less than satisfactory. The problem is compounded because it is not just the new session that experiences poor sound quality: the initiation of the new session will itself cause deterioration of the quality on all the other sessions already in progress. This sort of cumulative problem is just not consistent with the notion of “carrier class”. With currently little or no control over this service quality problem, it is no wonder that service providers want to find a way to do it better. Most attempts to manage QoS are at the packet level, and are based largely on prioritization of traffic. But giving precedence to the packets that make up vulnerable services (such as voice) and relegating less sensitive traffic to “best efforts” may mean significant delays and lost packets in a heavily loaded network. There are several problems with prioritization at the packet level. One is that the originator of the packet can decide which priority to apply, which may not be the same priority that the carrier wants to apply. But a bigger concern is: what do you do when you have more than enough “top priority” traffic to fill the pipe? Which packets do you leave behind? When random packets are dropped, they need to be re-transmitted, adding even more traffic, increasing the level of congestion. Prioritization at the packet level is clearly not capable of coping with severe congestion. One possible solution in such circumstances is to manage the traffic at the session level, not at the packet level. This is the task of the Call Session Control Function in IMS. What that means in practice is that once a session is set up, every packet will get through. As the network approaches overload levels, new sessions will not be permitted. The session controller will simply not pass on the session initiation request.